The Not-So Angelic Doctor: Is Praying Towards the East During Mass "Rubbish"? Is Praying Towards the East During Mass "Rubbish"? 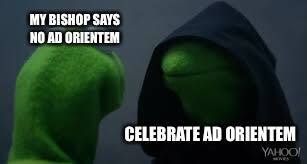 On the ever hilarious Catholic Memes page, a new meme was posted regarding the ad orientem kerfuffle that's been going on since the Second Vatican Council... but more recently since Prefect of the Congregation for Divine Worship and the Discipline of the Sacraments, Cardinal Sarah, addressed a liturgical conference earlier this summer in London. Now before I go on, I get the joke that is trying to be made in this meme, pictured below with everyone's favorite green Muppet, Kermit. But not everyone does when first reading this meme. 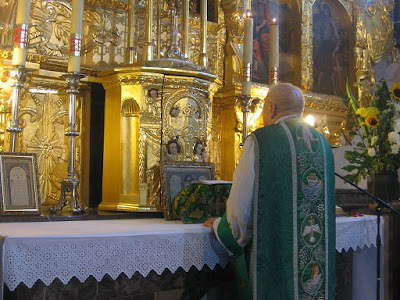 Apparently, there have been a few bishops in the US and UK who have told their priests that they should not (note, not barred) expect to perform the Ordinary Form of the Mass ad orientem, or with both priest and congregation facing the altar in prayer. I personally do not like this meme as the meaning can be misconstrued, especially for someone who has no foreknowledge of what has been going on the past few months. At first glance, it looks like the meme is advocating that priests and laity should disobey their bishops. Do I think it's funny? Yes, but the way it was executed is pretty bad. I think there was a better way to make the joke, and to make the meme not appear as if it were giving approval to someone disobeying their bishop. Jo: The reasons people give for 'facing East' are all rubbish. Where is God? a) in our midst; here, not over there; b) in the blessed sacrament of the eucharist, in the tabernacle, on the alter. So the focus of our worship is not 'over there', 'in the East', in any particular geographical direction, 'in the sunrise', 'in the sun' or 'behind that wall'. In our worship, we pay attention to 'the book that is being read from', 'the gifts', 'the altar', 'the sacrement of the eucharist', 'the person we're listening to', 'the person we're talking to', 'the people we're stood next to', etc. Try using a bit more common sense, maybe? Tom: During the Eucharistic prayer the priest isn't talking "to" us or "to" the Gifts. Alison Lees I never said he was, although at the dialogue before the preface, which is the beginning of the Eucharist prayer, he is talking to us and we are talking to him. I said that at some point, the focus of our attention is 'the gifts'. Also, there are times in the Mass when people talk to each other. It is true that most of the time, we are talking to God, or the priest is acting as spokesperson, talking to God. But take the Mass as a whole; it isn't all one priest talking to God, nor should it be. Tom: And neither of those statements are true during the E.P. [Eucharistic Prayer], which is the time of the Mass in question in ad orientem debates. So your points in that regard are moot. Jo: The ad-orientem 'debate' is for the Mass as a whole, not that part of the Eucharistic Prayer that follows the Benedictus. Also, if the priest is standing between the congregation and the altar, he is blocking their view of what should be the focus of their attention; the altar, and the sacrament thereon. Tom: I have yet to meet a priest who supports facing ad orientem for the homily. So I call B.S. on your point. And I would argue the focus during the E.P. is NOT on the Gifts but on the act of offering them to the Father. Since versus populum celebration "blocks the view" of this in some but not all cases, I think that ad orientem is pastorally more beneficial. Jo: Now you are using a reductio ad absurdum argument. You know very well I didn't mean that the ad orientem argument included turning east to deliver the homily. But if a priest is happy to face the congregation for the homily, there is no reason why he should not face the altar from a different side than the congregation to pray the eucharistic prayer. Also, spot the terminology. 'ad orientem' means 'facing east' not 'facing the same way as the people'. Tom: That's not what a reductio ad absurdum argument is but nevermind that. I'm aware of what "ad orientem" does and doesn't mean. Jo: ...When I celebrate Mass, I have a good view of the gifts being offered at the time that they are being offered. Tom: ...My overall point is, it seems "common sense" to worship ad orientem. And calling strawman arguments "rubbish" doesn't make the actual arguments rubbish. It just makes you rigid and doctrinaire. Jo: If you want to worship facing east, fine. I'm just trying to explain why it doesn't make common sense for people to dictate that we should all choose to face 'east', when the focus of our worship is never 'east'. Tom: Who's dictating? The dictation is coming from those who want to forbid the practice? Nicholas: Tom asks a great question: who is dictating? Certainly not Cardinal Sarah, as he merely suggested Roman Catholics to return to their tradition of facing East (or liturgical East) during the Mass in common worship. "The reasons people give for 'facing East' are all rubbish." Come on Jo, really? All the reasons for both clergy and laity to face in a common orientation during Mass are rubbish? You only mentioned a few "reasons" and some are caricatures, such as "behind that wall". Did you know that the word "orientation" comes from the word "Orient" which, in Latin, means "East"? This is how we can talk of liturgical East. "It is not without reason or by chance that we worship towards the East. But seeing that we are composed of a visible and an invisible nature, that is to say, of a nature partly of spirit and partly of sense, we render also a twofold worship to the Creator... Since, therefore, God is spiritual light, and Christ is called in the Scriptures Sun of Righteousness and Dayspring, the East is the direction that [is] assigned to His worship. "Moreover Christ, when He hung on the Cross, had His face turned towards the West, and so we worship, striving after Him. "And when He was received again into Heaven He was borne towards the East, and thus His apostles worship Him, and thus He will come again in the way in which they beheld Him going towards Heaven... So, then, in expectation of His coming we worship towards the East. But this tradition of the apostles is unwritten. For much that has been handed down to us by tradition is unwritten." "For were we to attempt to reject such customs as have no written authority, on the ground that the importance they possess is small, we should unintentionally injure the Gospel in its very vitals... For instance... who has taught us in writing to sign with the sign of the cross those who have trusted in the name of our Lord Jesus Christ? What writing has taught us to turn to the East at the prayer? "For we are not, as is well known, content with what [St. Paul] or the Gospel has recorded, but both in preface and conclusion we add other words as being of great importance to the validity of the ministry, and these we derive from unwritten teaching [of the apostles]." "if the priest is standing between the congregation and the altar, he is blocking their view of what should be the focus of their attention; the altar, and the sacrament thereon... And when I celebrate Mass, I have a good view of the gifts being offered at the time that they are being offered." Well, I hope you remember that whether the Mass is being said ad orientem or versus populum, the priest always lifts the Host at the consecration, and he always turns to face the people at the minor elevation ("through Him and with Him, and in Him..."). So yea, the focus is always on the Sacrifice of the altar, but so what if you can always see what's going on? That shouldn't affect our worship of our Lord on the altar. Otherwise, all Eastern Catholics are doing it wrong. 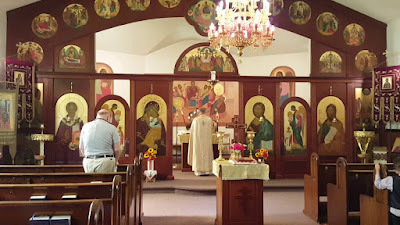 Especially, but not only, in the Armenian and Byzantine Rites of the Catholic Church, the priest always faces to the East and celebrates ad orientem, and they have a huge screen in front of them called an iconostasis. 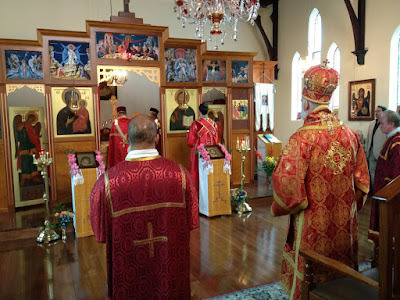 It's usually impossible to see what going on during the consecration unless you're sitting right in the middle, and they have no problem participating in the Divine Liturgy. Are they in the liturgical backwaters since they haven't embraced the Mass being offered facing the people? No, because they're following the same traditions of the universal Church that St. John Damascene and St. Basil speak of: they face East in a hopeful expectation of our Lord's second coming. Here are some pictures from (first) a Russian Catholic Divine Liturgy, and (second) a Ukrainian-Greek Catholic Divine Liturgy. Notice how the people on the sides have an obstructed view of the altar and the direction the priest is facing. Is this a bad thing? Are the reasons that they do this "rubbish"? Jo: Well, yes I do say that it is rubbish. Nobody ever said that the Lord is going to come 'from the East' at the last day, and even if he were, that wouldn't affect the place you stand say Mass. I have celebrated Mass with the priest standing between the altar and the congregation (out of necessity) and yes. Not only can I not see the altar, but the priest gets in the way. The few moments where the congregation's existance (sic) is remembered, the elevation, etc. are simply not sufficient. Also, no, it is not enough for me that I am in the same room where the Mass is being celebrated. I expect to see, to hear, to watch, to listen, to understand, to respond, to join in, to share. Otherwise, I might as well not be there. "Nobody ever said that the Lord is going to come 'from the East' at the last day." So there's that, not to mention the words of many saints throughout the first centuries of the Catholic Church. Now I agree, the Mass is no less important if the priest is facing towards the people or East in a common direction with the people. 8 out of 10 Sundays the Mass I attend has the priest at my parish facing the people in the Ordinary Form (OF). But there's a significance behind why we Catholics today, and Catholic Christians (and the Orthodox, and Anglican, Lutheran, etc.) throughout history have faced East during Mass, as shown in the writings of the Doctors of the Church. As Pope Benedict XVI said, "a common turning to the East during the Eucharistic Prayer remains essential. This is not a case of something accidental, but of what is essential. Looking at the priest has no importance. What matters is looking together at the Lord. It is not now a question of dialogue, but of common worship, of setting off towards the One who is to come." You also said, "Not only can I not see the altar, but the priest gets in the way." And so what if you can't see the altar? Again, why is that a bad thing? In the Latin Rite, it's not like the priest is totally obstructing the altar. The time between consecration and reception of the Eucharist isn't that long 5 or 10 minutes, tops. We adore the Eucharist during both elevations, and at least in the EF of the Mass, there are no distractions from a prolonged sign of peace when our Lord is on the altar. "The few moments where the congregation's existence is remembered, the elevation, etc. are simply not sufficient. "Also, no, it is not enough for me that I am in the same room where the Mass is being celebrated. I expect to see, to hear, to watch, to listen, to understand, to respond, to join in, to share. Otherwise, I might as well not be there." This is ridiculous, and you know it. I guess if I take your word for it, I might as well not even be there when my two year old son throws a tantrum during Mass and I have to take him in the vestibule behind a closed door. I guess I might as well not even be there when I attend Mass (Divine Liturgy) at the Ruthenian Catholic parish near my home since I can't see the consecration. I guess I might as well not even be there at an OF Mass said ad orientem because the priest is standing in between me and the consecrated Host on the paten. Do you see how ridiculous that sounds? "Now it is clear that the faithful offer the sacrifice by the hands of the priest from the fact that the minister at the altar, in offering a sacrifice in the name of all His members, represents Christ, the Head of the Mystical Body. Hence the whole Church can rightly be said to offer up the victim through Christ, [and that] it is based on the fact that the people unite their hearts in praise, impetration, expiation and thanksgiving with prayers or intention of the priest, even of the High Priest himself, so that in the one and same offering of the victim and according to a visible sacerdotal rite, they may be presented to God the Father." I can see, hear, watch, listen, understand, respond, join in, and share at Mass just fine as Pius XI said by being present at the Mass and offering my prayers. We are not passive if our "view" is supposedly "obstructed"; if that's the case Eastern Catholics and all Latin Catholics prior to the Second Vatican Council would've been better off not attending Mass, as you yourself put it. So here's my question for you Alison: Are the Russian Catholics and Ukrainian Catholics "doing it wrong"? Are they saying the Mass in a way that makes their reasoning for doing so "rubbish"? 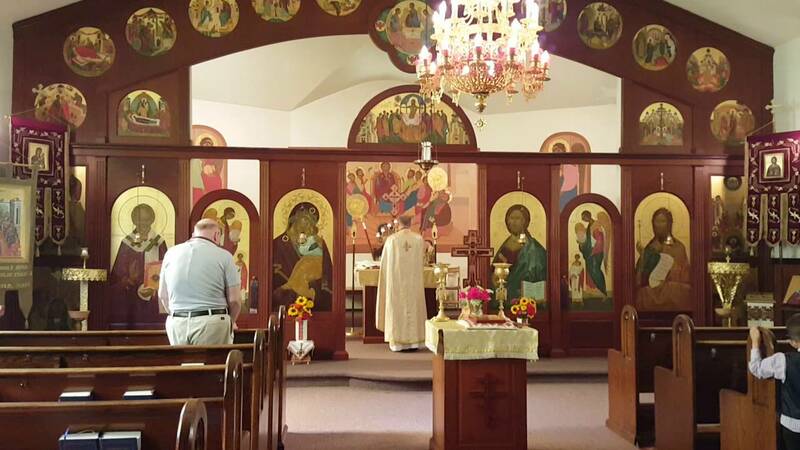 If you were in an area where the only Mass you could attend on Sunday was at a Ukrainian Catholic parish, would you attend and scoff at their legitimate traditions, and call the iconostasis "rubbish"? "When we rise to pray, we turn East, where heaven begins. And we do this not because God is there, as if He had moved away from the other directions on earth..., but rather to help us remember to turn our mind towards a higher order, that is, to God."